Will you be tuning in to watch this year’s Republican and Democratic national conventions in the hope of seeing something of historic significance? The managers of both conventions are working hard to make sure that you don’t get your wish. From their standpoint, the best convention is a precooked and tightly controlled event that passes placidly and without controversy into the annals of national forgetfulness. They would vastly prefer a convention that resembles a four-day infomercial to one that includes anything unexpected or consequential. It was not ever thus. For more than a century after the first convention of the modern Democratic Party in 1832 and of the Republican Party in 1856, the national conventions were often occasions of great drama, marked by titanic struggles among rival factions and fevered excitement around the selection of a presidential nominee and the construction of a national platform. Highlights and lowlights of that era included the 1844 Democratic convention which named Tennessee governor James Polk as the first “dark horse” presidential nominee, the 1912 Republican convention that led to the “bolt” of Theodore Roosevelt’s progressive faction, and the 1924 Democratic convention which required a record 103 ballots over nine days to nominate John W. Davis of West Virginia. There was no necessary connection between controversy at a convention and the eventual electoral outcome. Warren G. Harding won the 1920 presidential election despite having been selected as his party’s nominee by bosses meeting in the original “smoke-filled room” at the Chicago GOP convention. Harry S. Truman carried the 1948 election despite the walkout of segregationist Southerners from the Democratic convention in Philadelphia to form the Dixiecrat Party. 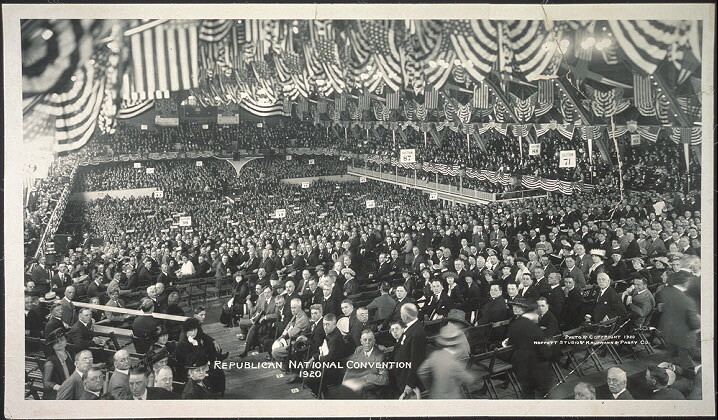 Republican National Convention, 1920. Photo by Moffett Studio and Kaufmann & Fabry Co. Source: Library of Congress. Political conventions once were raucous tribal gatherings. The 1860 GOP convention in Chicago was so noisy, according to one observer, that “A thousand steam whistles, ten acres of hotel gongs, a tribe of Comanches, headed by a choice vanguard from pandemonium, might have mingled unnoticed.” The chaos and bombast began to be reined in after television became a significant factor at the conventions. The 1940 Republican convention was the first to be televised, but television had little immediate effect on the old-time rituals since only a small percentage of Americans owned a TV set until the 1950s. The 1952 Republican convention was the last to feature fistfights on the floor, as conservatives supporting Robert Taft clashed with moderates supporting Dwight Eisenhower. But soon thereafter, both party officials and TV executives decided that the traditional divided, brawling convention was bad for business. Starting in 1956, conventions began to become more staid and scripted affairs. It took a while, of course, for the parties to learn how to prosper in the new era of wide public attention to televised national conventions. 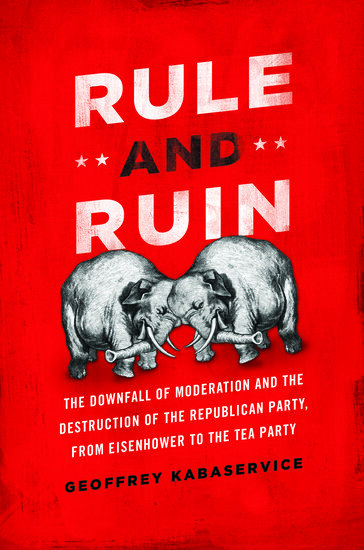 The 1964 Republican convention was a political relations disaster. Conservatives had finally succeeded in nominating one of their own — Barry Goldwater — over the opposition of the moderates and were in no mood for conciliation. Delegates harassed the “liberal” media and howled down New York governor Nelson Rockefeller, the hated leader of the progressive faction, when he attempted to address the convention. They roared when Goldwater praised “extremism in the defense of liberty.” Millions of Americans watching the spectacle were appalled, and voted Democratic by landslide margins. Four years later, the Democrats faced their own convention debacle as Chicago police beat and gassed protestors outside the convention hall, sparking angry divisions among the delegates for all the nation to see. The spectacle likely contributed to Democratic nominee Hubert Humphrey’s narrow loss to Richard Nixon in the 1968 elections. The 1968 protests in Chicago were aimed not only at the Vietnam war but at the undemocratic system by which presidential nominees were chosen. Humphrey secured the Democratic nomination even though he had not entered a single contested primary election. Starting in 1972, most delegates to the Democratic national convention were bound to candidates who had won their states’ primary elections or caucuses; Republicans followed suit in 1976. The result of this reform was that the presidential nominees of both parties became largely determined long before the conventions. The last serious contest over a party’s presidential nomination came at the 1976 GOP gathering in Kansas City, when incumbent president Gerald Ford narrowly defeated his conservative challenger Ronald Reagan. Four years later, Democratic incumbent president Jimmy Carter fended off a similar though less formidable challenge from Ted Kennedy. Both Ford and Carter lost their reelection bids, which reinforced the party professionals’ belief that divided conventions must be avoided all costs. There hasn’t been any real division or even uncertainty about the presidential nomination at a convention for the past thirty-two years. Illinois delegates at the Democratic National Convention of 1968, react to Senator Ribicoff's nominating speech in which he criticized the tactics of the Chicago police against anti-Vietnam war protesters. Photo by Warren K. Leffler. Source: Library of Congress. Party conventions now seek to create hoopla around their nominees and stir up the party faithful while avoiding anything that could damage their electoral chances in the fall. They don’t always succeed. For example, the 2004 Democratic convention’s showcasing of John Kerry’s military service in Vietnam backfired as Republicans made it the basis of their “Swift Boat” attacks on Kerry’s war record. The managers of Republican conventions have to walk a fine line in trying to excite their conservative base without alienating moderates. Their most notable failure came at the 1992 GOP convention, when the party establishment behind President George H. W. Bush attempted to appease the restive right wing of the party by giving Patrick Buchanan a prominent speaking opportunity. Buchanan called for holy war against liberals, feminists, and homosexuals, thrilling social conservatives but giving the public a too-revealing glimpse of the forces of intolerance brewing inside the GOP. Television, electoral predetermination, and the massive amounts of money riding on elections have combined to make conventions into tame, predictable, and rather boring occasions. Like most propaganda spectacles, they are hollow and unconvincing. I’m skeptical that many viewers will really believe that the GOP is a party with large numbers of minority supporters (as television coverage inside the convention hall might lead one to believe) or that the Democrats are enjoying any real resurgence in the South (despite the rhetoric of Charlotte’s boosters). I suspect that most people who follow the conventions closely are either die-hard partisans or the political equivalent of those NASCAR spectators who want to see a crash, and I doubt that any of them will come away satisfied. To me, the only really important aspect of conventions nowadays is the behind-the-scenes negotiations that go into determining the party platforms. Granted that a presidential nominee isn’t bound by his party’s platform, the platforms are still significant as a statement of the party’s principles and governing intentions, and it says something about a presidential nominee if he chooses to stand behind them. Richard Nixon, when he was the GOP presidential choice in 1960, spent a lot of his political capital to persuade the platform committee to make the party’s civil rights plank more progressive. Will Barack Obama or Mitt Romney make any similar efforts to resist the ideological inclinations of their party bases? Stay tuned.